So why is a backside boardslide called backside when the rider is facing the boat? Isn't the rider's back supposed to face the boat when sliding backside? What is the difference between a boardslide and a lipslide anyway? These are all common questions that come up when talking about sliding. Those that are new to board sports will be totally confused when these topics are brought up and some that have been around a while may still be confused. We are going to get you in the know and explain these terms as best as we can. Hopefully it will help you understand a little bit more next time you read a caption in a magazine or hear someone mention a new trick they landed. If anything, you may soon realize exactly how difficult these obstacle maneuvers actually are next time you see someone stick one like they were born to do it. One of the most common misconceptions when dealing with sliding is a backside slide vs. a frontside slide. 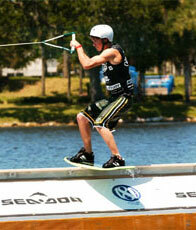 It is expected that these terms are commonly misunderstood because wakeboarding has always used these terms loosely. We finally have standards that most people are sticking with in wakeboarding and wakeskating to differentiate edging terms (heelside and toeside), spinning terms, sliding terms and even shuvit terms. All four of them are different, but are the same in many ways. It can get confusing when adding in lipslides, 270 ollies and other variations, but to keep things simple, when imagining the following descriptions in you head, just think of a regular board slide. You can later go back and figure out the different variations on your own. With that being said, figuring out variations will be your homework assignment for today. Many people tend to think that the name of a slide is determined by the way the rider is facing when they are actually on top of the obstacle. In fact, it is all in the approach. If a rider approches an obstacle with his back facing the obstacle (heelside edge) then the slide will be a backside slide. The rider will be facing the boat while sliding. Remeber, we are talking about a regular ol' board slide here. Backside slides are usually easier to most people and sliding experts will usually recommend that when you learn how to boardslide that you start off with a backside slide. This term also applies to boardslides on the wake, not just on sliders. When you are ready to step up your sliding skills, then get ready to bring the pain with a frontside board slide. Frontside slides are performed when the rider approaches the obstacle facing it. The rider will cut into the rail or wake on his toeside edge. Once the rider is on the obstacle, the rider's back will be facing the boat. The frontside slide is usually more difficult to people at first, but becomes more comfortable with a little practice and some trial and error. This term also applies to boardslides on the wake and any other obstacles. Once again, the approach is the determining factor between a boardslide and a lipslide. It isn’t the way the rider approaches the obstacle, but similar. The difference is determined by the part of the board that crosses over the obstacle first. A boardslide is when the nose of the board goes over first and a lipslide is when the tail of the board goes over first. 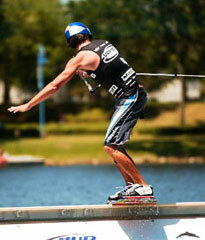 For example, imagine that you are riding right outside of the wake with your back facing the wake. If you then do a backside turn onto the wake and start sliding, that would be considered a backside boardslide. The nose of your board crossed over the wake first. Now imagine the same thing but on the other wake. You are now riding right outside of the wake with your toes facing the wake you are riding next to. In order to perform a lipslide from this position, you will have to push the tail of your board up and over the wake causing the tail to cross over first. This will be considered a frontside lipslide. Backside lipslides are generally harder (especially on rails) because you have to ollie over the rail and turn backside in the air onto the rail. In conclusion, we hope that we have helped you figure out the different sliding terms. It may take you a little while to completely figure things out in real time, because it does happen very quickly. Just be patient and keep an eye on the riders approach. The approach is the key to entire terminology basis. Always remember to wear a helmet when attempting to hit sliders and do not hit a slider if you are not ready for it. Hitting a solid object at 20+ miles per hour can be hazardous to your health.